The demo questions are best answered by Greco @ SBOL who would be providing them to you. Email him at info@skiboardsonline.com . And if you really want to try a lot of boards try to connect with other riders in your area or at one of the events like ShredFest. Chamfering is cutting back the top sheet and sidewall materail. You are essentially knocking the corner off the top edge of the sidewall. To prevent and delamination of the layers when doing this I suggest that you file the edge with a downward stroke only not an up and down sawing motion. This will prevent the file from catching the top sheet, lifting it, and creating any "gaps". I know many of the members have chamfered their own boards using a file and guide or even a hand sander. I have never done it to brand new boards but do use a sander on them once the edges start to get chipped. The Blunts and the re-released "Melting Cloud" 2012 RCs both have a new finish to their edges; they seem to be "factory chamfered. They are much more durable than the old style and resist chipping and scratching. Maybe more of the boards will come out with this new and improved edge next season? Interesting! I was wondering about that because I'm debating between the Blunts or the RCs for next season and wanted to maintain them to the best condition I can! That's why I was asking about chamfering etc. Also, in regards to waxing boards, I know most of you guys do it yourself. But would regular ski/board shops wax the skiboards the same way? (Curious as to whether they've seen or if any different waxing techniques because my buddy knows the owner of a store and gets discounts on waxing and some gear). If so, I'd just bring my gear in with him and get it waxed together. Also, in regards to new boards with the factory wax, is it better to hit the slopes at least once with them before getting them waxed or should you put an additional layer over that immediately? But would regular ski/board shops wax the skiboards the same way? (Curious as to whether they've seen or if any different waxing techniques because my buddy knows the owner of a store and gets discounts on waxing and some gear). If so, I'd just bring my gear in with him and get it waxed together. The waxing should not be any different for a skiboard. I would definitely recommend you get your own iron, wax scraper, wax and edge tuning tools and do all of that yourself. Wax and proper edge maintenance are keys for your boards performing well. I wax my boards pretty much after each time I use them. Hot wax every 2-3 times out and then paste wax touchups in between. I also check my edges each time after I ride and take care of any knicks. Sharpen the edges about every 3 times out and also if I know it will be icy. Factory wax is basically just to help protect the bases during shipment. For new boards I apply hot wax and do a hot scrape (don't let the wax cool) to lift off the factory wax. Then, I give them a nice hot waxing. It typically takes a few times hot waxing before the bases are saturated so I typically hot wax new boards after each time out for the first 3 or 4 times until the wax starts to last and I don't see any graying on the bases after 1 time out. I wax and tune my own boards as well. The equipment to do so doesn't really cost much and pays for itself after the few few weeks. More than anything it gets you into the habit of inspecting your boards bases and edges for easy to fix damage. I think looking after your own gear adds to the enjoyment of the sport and will keep your boards in better condition than a shop will. There are tons of videos online showing you how to wax and tune at home. The Tognar Toolworks catalog also has hints and tips pages along with the products for sale, they will send you a copy. Sempai checks his boards after every use. He takes the bindings off, wipes them down and checks the bases and edges for nicks. All his boards look like the day he bought them. Well, almost! How often to wax is a great subject. Some, like me and Bluewing do it every time out, some every couple of weeks, some once a season and some never. My wife didn't wax her boards for several seasons and it didn't seem to affect their performance. Sometimes good bases is all you need. Interesting! I was wondering about that because I'm debating between the Blunts or the RCs for next season and wanted to maintain them to the best condition I can! That's why I was asking about chamfering etc. With the new edge design I wouldn't worry about chamfering the Blunts or 2012 RCs. Not exactly accurate. I don't remove the bindings. I do wipe them down and check for damage after every use. If there are nicks or splinters coming off the sidewalls, I sand them down in hopes that they won't get worse. I take mine off. It really bugs me to clean my boards then have some dirty ice melt leak out from under the binding and have to clean them again. Not that I'm OCD or anything. i may do that too but at the moment, I'm too lazy for that! I just tilt it and let it leak out from the side onto a towel. Last post was in April from my last trip so I thought I'd get things started with another newbie question. Since I'm heading into my 2nd season, I just wanted to ask a few questions because I was pretty confused. 1) In regards to non-release Receptor bindings, I understand that it offers a bit tighter connection with the skiboard. However, in all my experience up to this point, I've only ever used release bindings (or non-release ones while snowboarding). I've never used the "bearclamps" before and not entirely sure how they work. If someone could link me a video/thread explaining how they lock into place or what type of special boot you need, that'd be great. I'm debating whether or not to get a pair and use them as backup in case softboot non-release doesn't work out too well. (Nice to have a backup!) And with regards to boots, anything in particular I should be looking out for? For example, Full Tilt High Fives seem to look pretty sweet. 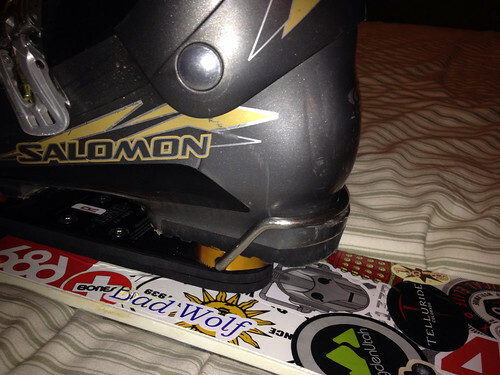 2) In regards to upgrading your own snowboard bindings, is there anything in particular you need to look for? I'm just curious as to what would qualify. Thanks for your help in advance and here's to another solid season on the slopes! Release bindings have springs in their mechanism which naturally have a little more "give" to them and are often mounted on risers. Non release bindings have very little give and can be directly mounted, hence the tighter feel. 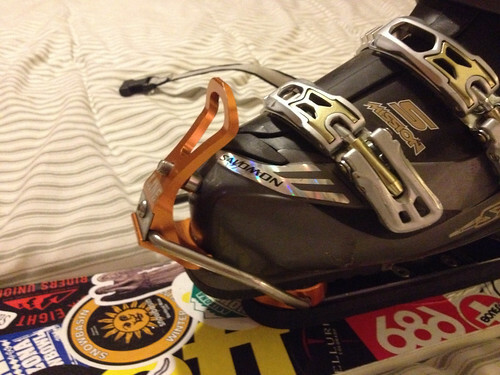 Obviously the bindings made out of metal and with thick bales are better than the cheap snowblade composite bindings. 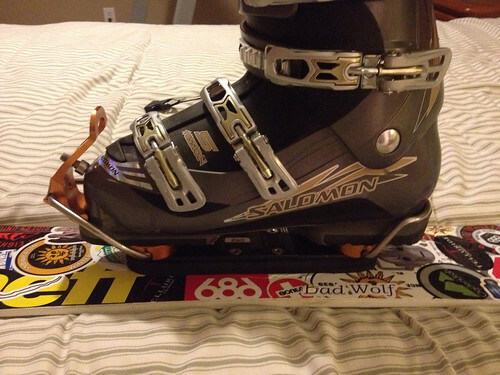 They work with any hard ski boot that will fit in a standard release binding. Thanks for the detailed response as usual! I finally understand the heel aspect of it. I'm just curious though. Does the front "lock" into place on the ridge too? So it's more like a tight clip on that clicks? Or do oyu have to adjust the front part each time you put on your boot? If you go with release bindings, when ordering you will be asked your height, weight, age, and boot sole length. The bindings will be adjusted for you prior to being shipped. My question to this is, I gave them my info and my boots do fit correctly into the bindings, but the bindings came with a tag that said they should be adjusted by a pro. This was also seconded by Greco as they didn't have my boot and did it to specs. Do I need to have the bindings adjusted by a pro or are they fine? The tag saying the bindings should be adjusted by a pro is a liability protection for SBOL/Spruce because the final step in setting up the bindings is to verify the forward pressure setting. If you are not knowledgeable about and/or comfortable checking the forward pressure setting - then definitely take the bindings and your boots to a local shop and have this final adjustment done. If you don't know how to verify the forward pressure setting, search around forum for one or more posts on it. If you can't find anything, PM me with you email address and I will send you some documentation. It is not difficult to do - I do it on my and my daughter's bindings. However, if in doubt, take them to a shop. They might do it for free or at the very most a nomimal charge. Incorrect forward pressure setting could result in pre-release (your binding releases when it is not supposed to) or non-release (binding doesn't release when it is supposed to) - both of which are undesirable. Thank you Bluewing, I'll check the forum for threads, I don't mind doing the adjustment myself. If I can't find what I need, I'll PM you! !